Do you love the simplicity of flower outline drawings? When I first started to teach myself to draw, I was always searching for something that I could illustrate successfully with my limited talent. Flowers were the answer! When I drew a lovely flower without too much effort, that encouragement spurred me on to do more. Take a look at this outline of an Arctic Poppy. Everyone has different taste but I love the elegance of these outlines. When you are drawing flowers, you can make the task easier by concentrating on one petal at a time. Take notice of the contours and outer shapes. Start off by doing your initial sketch lightly (it's easier to erase!). When you notice you are establishing a rhythm with your flower drawings, it's a good idea to try sketching a real flower from all different angles. It's a little challenging but you do discover which is the easiest aspect to illustrate. The next flower image is of the Bird Of Paradise -- I think it is quite an exotic looking flower. You don't have to copy every petal if you are drawing something complex like a Chrysanthemum. Instead, define the major petals and leave the rest to the viewer's imagination by using some vague lines. When you are drawing flowers, find a comfortable seat and your favorite sketch pad. I still like doing my drawings on photocopy paper but choose whatever suits you. These flower outline drawings are all done with my favorite 2B mechanical or retractable pencil. The lead doesn't need sharpening and it gives a clear, crisp line to my pencil flower drawings. A "B" grade pencil has the softest lead and it is the best grade of pencil for beginner artists. A 2B can do everything that we require - that is, it can be light or dark, depending on the pressure we use. Click here if you want more information about art pencils and paper. Get your pencil ready and start your flower outline drawing. Remember to ignore any and all detail within the flower, you are only drawing around the edge. Choose which outline appeals to you and copy it to the best of your ability. Sometimes I abort an attempt and move straight onto starting again - attempt number two, or three, you know how it goes. This can happen lots of times and it's normal. Actually, it's interesting when I now look back at those pages to observe my learning process. Once you are completely satisfied with your initial light outlines, it's time to go back over your flower outline drawings using more pressure on your pencil to make the best lines darker. You can add some random strokes (holding the pencil side-on to give a smudge effect) to indicate shadow on petals, just as I did to my outline of a California Poppy shown here on the right. Examples and exercises that show you exactly how to go about drawing. Erase any lighter lines that don't belong and re-do the lines that the eraser touched. I had to do that with the daisy outline, it was difficult to erase the light lines without touching the main lines. Once you have an outline that you are satisfied with, you can go ahead and start observing some details that you would like to include. Look back at your flower reference picture and identify the darkest areas (this indicates where the shadow lies). Remember that squinting helps you to pick out the light and dark areas. If you want to convert your outline into a proper drawing with lots of shading, don't forget to leave some portion of the petals without any color at all. In other words, let the white of the paper work for you so it portrays where the light hits your subject. When you tackle your flower outline drawings, don't be afraid of making mistakes. This is Nature that we are copying from and She doesn't have any set rules on how things should appear. This outline of a Prairie Rose (right) isn't perfectly drawn but I like the way it looks. I just try to get the general shape down on paper first. Come back to the drawing after a few hours and run a critical eye over it then. It's easy to get lost in a drawing while you are involved with it and it's harder to spot errors at that time. Drawing flowers can be done in so many ways but I opt for the simplest method - look and copy. This little begonia drawing is actual size and it took only minutes to draw. Some artists draw a single flower within a circle and some divide a flower into four parts. With a little bit of trial and error, you will work out which method suits you the best. 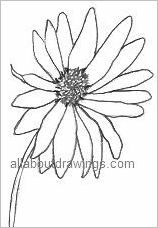 Create your flower outline drawings by copying any of the images here. This is how I practiced so I know you will benefit, too. Once you've mastered the first flower, you become bolder with confidence so just start experimenting and get those drawings down on paper!